The Netherlands Aqua Trade Fair for water treatment, water management and water technology is an annual showcase for the latest innovations and products in the field of water treatment, water management, and water technology. 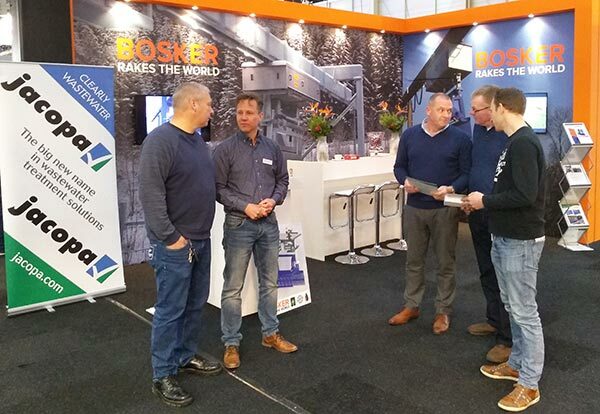 As usual, Machinefabriek Bosker en Zonen BV (Bosker) were at the three-day event held from 19-21 March 2019 in Gorinchem, Holland to present their latest innovations in the field of wastewater treatment. Bosker has been designing, building and installing low-maintenance trash rake machines since the 1960s. The company’s equipment which is a globally recognised and respected solution for removing debris effectively is available in the UK and Ireland from wastewater specialists Jacopa who shared the stand with Bosker. Likewise, Bosker represent Jacopa’s premier Jones + Attwood (J+A) product line in the Netherlands. The J+A brand is synonymous with reliability and robustness, and the extensive range of products includes the well known and widely installed Washpactor system, tough, reliable screw classifiers and the high-performance JETA grit trap. On the stand Jacopa’s Mick Burton handled many enquiries for the J+A equipment including the company’s Hi-Flow screen which is available with screen apertures of 2, 3, 5 or 6mm, a range of screen lengths are also available. The J+A Hi-Flow is a high performance, robust and reliable wastewater screen and several have been installed in Holland recently. Jacopa’s experienced team work with customers to ensure that each unit delivers optimum performance by tailoring each screen specifically to meet individual requirements. Pictured third from right, Mick Burton of Jacopa explains the features the company’s Hi-Flow Screen.